Recently one of Sydney's longest standing and best known coach and bus operators, Hopkinsons has included a number of Higer coaches to their fleet on the basis of pricing, support and their manoeuvrability. Hopkinsons has added seven Higers to its fleet over the past two years - replacing some of its older buses with new 12.3m Higer RoadBosses as well as two new 28 seat Munro midi buses. According to Michelle Hopkinson, managing director at Hopkinsons, Higer has matched the company's needs from the very first dealings and every step of the way. "Higer has been terrific right from when my late father Graham and our workshop manager Geoff Cooper began dealing with them," said Michelle Hopkinson. "In negotiations on price and trade-ins Higer produced a very attractive deal along with assurances of excellent pre-delivery and after sale service which they have certainly delivered on," said Michelle. "We have been very impressed with Higer's service and communications from our first negotiations, through the ordering and purchasing and on to the pre delivery and after sales service. "The Higers have become an all-round favourite with our drivers because of their manoeuvrability and compact two-axle design," she added. "Our sales team have found them to be very popular with our customers and that brings return business while the reliability means they are always ready for service and we don't have any problems fulfilling bookings," she added. "From a management point of view the Higer's are proving to be less expensive to buy and run which benefits our bottom line," she said. Hopkinsons has also recorded a reduction in collisions and incidents thanks to the manoeuvrability an ease of operation of the Higers in tough city conditions. "Our operations and sales team agree that the specifications of the Higers are perfect for our operations because they are a two-axle vehicle which are easy to drive and manoeuvre around the city and suburbs," Michelle Hopkinson said. "We've seen a reduction in the number of accidents compared with our three axle coaches that we were using for a lot of our work and the Higers are perfect for day tours, rail replacement and city transfers," she added. "Overall we are very satisfied with Higer because they have provided our customers with coaches that better suit their travel requirements," Michelle concluded. Higer was awarded the Asia BAAV Bus Expo Bus Coach Builder of the Year for 2007, 2008 and 2009. It also won the Equipment award and the Safest Brand of Choice award in 2006, 2007, 2008 and 2009. Through innovative engineering Higer tailor made its bus range to meet Australian standards and conditions and built to withstand the rigours of the harsh Australian environment. 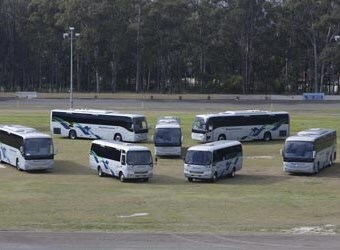 According to Higer, in 2011 they were the most popular non-route bus on the Australian market and recorded substantial growth despite a downturn in the Australian market.